“8” is sweeping the nation. We are pleased to announce that readings are now taking place in all 50 states. From Alaska to Florida, Maine to Hawaii, people across the nation are learning about what happened when fear and prejudice were put on trial. The response to the play has been overwhelming. An estimated 40,110 people have attended a live reading. This is in addition to the 880,000 people who have watched the L.A. premiere on YouTube or the millions of people reached by an audio recording broadcast on public radio stations and in audiobook format. 34 readings took place in states most critical to the marriage fight this year. States like New Hampshire, where the Legislature overwhelmingly defeated attempt to repeal the state’s marriage equality law in February, to Maine, Maryland, Minnesota and Washington, were equality won at the ballot box for the first time ever. But for every statistic we can talk about, nothing compares to the personal stories we hear every day. Based on the transcripts of the 2010 Prop. 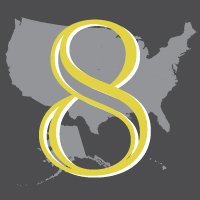 8 trial, “8” documents the nation’s truth commission on marriage and condenses it down to inspire understanding, acceptance and action. If you are interested in hosting a reading of your own, let us know.